Surprisingly delicious and easy to make. 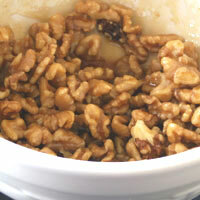 Delicious with walnuts, pecans, or almonds. Preheat oven to 250. Line a jellyroll pan with parchment or waxed paper. Stir all ingredients until combined. Bake 40-50 minutes until dry and crunchy. Every 10-20 minutes during baking remove pan from oven and stir well. Bake 60 minutes, then stir. Stir every 10-20 minutes until dry and crunchy. 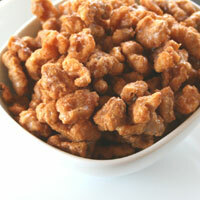 It is important to stir during baking to get all of the maple off the parchment and onto the nuts. Stirring also helps them bake more evenly. 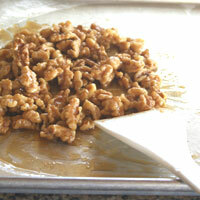 When they are done remove the parchment paper so the walnuts won’t stick to it. Cool completely and serve or store in an airtight container up to two weeks. 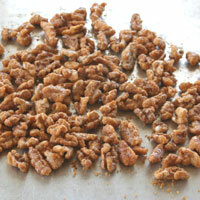 Sticky - Be sure to bake the nuts until they are dry. If they are undercooked they will be sticky and soft. Overbaked - If the nuts are overdone they have almost a fried taste. Bake them until they are dry and not longer. 2. Stir all ingredients until combined. Spread onto prepared pan. Bake 40-50 minutes until dry and crunchy. (1)Every 10-20 minutes during baking remove pan from oven and stir well. When they are done remove the parchment paper so the nuts won’t stick to it. 1. 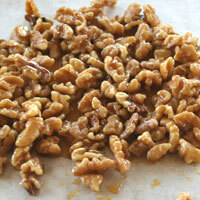 It is important to stir during baking to get all of the maple off the parchment and onto the nuts. Stirring also helps them bake more evenly.